Technical Analysis (TA) is a fancy name for something very simple—the study of past prices, usually in the form of stock charts, which is why practitioners of TA are often called “chartists.” Chartists study stock charts to predict future prices. Although this guide uses examples of stock charts, the principles work just the same on any type of financial instrument, including forex charts, futures charts, market indexes, etc. Most have heard of fundamental analysis (FA). In fact, it’s the stock market investing strategy that most are taught first. FA looks at things like earnings, cash flow, debt or any other financial aspects of a company, i.e., the “fundamentals” of a company. “Fundamentals” can also refer to economic fundamentals affecting the entire stock market. A person using FA might study financial statements to discover what he thinks a company’s stock should be worth, then, if the stock is trading below that value, buy it hoping to make a future profit. 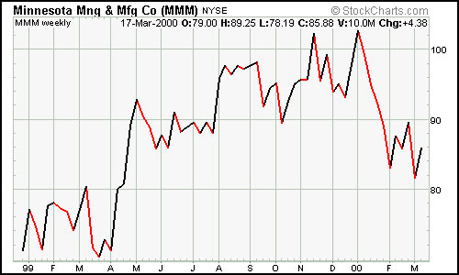 In this way, FA is a stock market investing strategy concerned with the inner workings of companies. In contrast, pure technical analysis isn’t concerned with financial statements, management or anything underlying a company’s business. Chartists only study how stock prices have behaved in the past and how that could affect them in the future. A chartist using technical analysis might buy and sell stocks knowing nothing about what the underlying company does. As a result, pure TA is a stock market investing strategy not concerned with the inner workings of companies. For an example, a person using TA might notice that in the past year, every time XYZ’s stock goes down to $25, it soon bounces back up to $35. He would then buy XYZ at $25, hoping that it will bounce back up to $35 again. He doesn’t necessarily know or care why XYZ has been bouncing between $25 and $35, but he tries to profit from it nonetheless. ● The Better Stock Market Investing Strategy: Technical Analysis or Fundamental Analysis? Regardless of how you use technical analysis, it should not be ignored completely. When it comes to finding good stock market investing strategy, information is power, so you’re not doing yourself any favors by ignoring the charts. While extremists deny the utility of technical analysis, most reasonable people concede it has its place. Many major brokerage houses hire chartists, and the financial media often refer to it. At worst, learning TA will lead to a more thorough understanding of the market; at best it will prove to be a valuable money-making tool.